BMW Williams F1 Jeans Jacket. 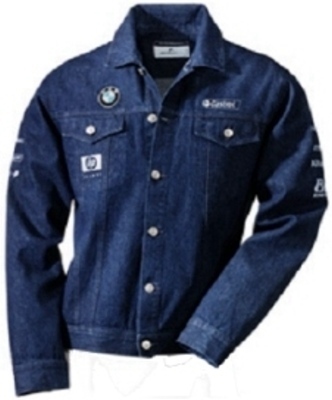 Dark blue, men's sizes, denim jacket with breast pockets, silver metal buttons with the BMW Williams F1 brand name at the edge. Embroidered team and sponsor logos on the sleeves, chest, shoulders and back.